We have available for use in our fleet of machines an Interdrain plow which is capable of installing pipes and services underground without the disruption of an open cut chain trencher. This plow is able to install land drainage in agricultural land including the addition of permeable backfill with minimum soil disturbance. The best use for the plow is for the installation of utilities such as water mains across agricultural or unstable ground. When the plow has been used in these situations, there is very little damage and after a few weeks there is only a line left in the ground where there has been full displacement caused by the leg itself. The Interdrain allows for fast utility installation, up to 600m per hour on long runs, this is the ideal method for installations that are time critical such as tidal areas or short working windows. 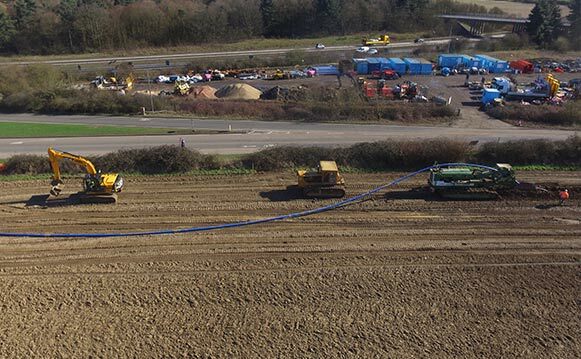 The interdrain also allows for installation in unstable soils as there is no need to have the trench left open to install the pipe, making it the perfect machine for working in sand or marshes.